Indeed, this Saturday's cycle has been topped by word of a "Purple Drought" of Apocalyptic proportions: after a ten-month moratorium on the naming of monsignori while studying the practice's future, the Pope has reportedly restricted future awards of the honorary prelature to priests over age 65, and then only to the juniormost rank of Chaplain of His Holiness, which entitles the recipient to the black cassock with violet sash and piping for choir and non-liturgical use alike. According to the initial report by Turin's La Stampa, all current monsignors retain their rank and privileges as conferred. Having spanned some 15 degrees of varying titles, vesture and perks before Vatican II – including some which lasted only for the lifetime of the Pope who conferred them – the last major reform to the monsignorial honors came in 1968, when Paul VI folded the classes into three grades, all given for life, restricting all but a handful of Vatican officials to the simplified style of "Reverend Monsignor." 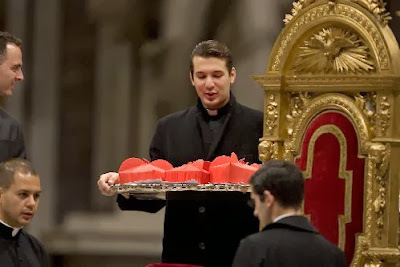 In the late 1990s – after perceived abuses of the system by bishops in the US and Western Europe – the Holy See restricted the honorees to comprising no more than ten percent of a diocesan presbyterate at any one time, as well as ending the then-common practice of allowing younger priests to become purple-cassocked Prelates of Honor without at least several years as Chaplains first. Despite the change, deserving secular clergy younger than 65 are still ostensibly eligible to receive both the Benemerenti Medal and the Pro Ecclesia et Pontifice Cross, which Francis has continued to grant to permanent deacons, laity and religious men and women who've provided exemplary service to the church. Among prior examples of what could now become commonplace under the new rules, after the 2008 Papal Visit to Washington, then-Archbishop Donald Wuerl – who's never elevated a monsignor either in Pittsburgh or the capital – conferred the Pro Ecclesia or Benemerenti on four of his priests involved in the event's planning alongside those given the trip's lay coordinators. In any event, the orders of papal knighthood – which, since the 1990s, have been open to laywomen as well as men – are still likewise being awarded in the new pontificate. All that said, we're only just approaching The Main Event. 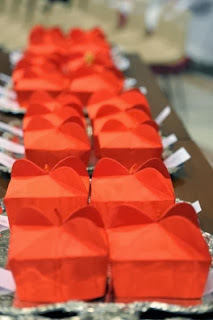 With a 22 February Consistory already announced, this weekend begins the time-honored waiting-game for Francis to reveal his first batch of new cardinals so the necessary public prep for the rites can duly get underway. 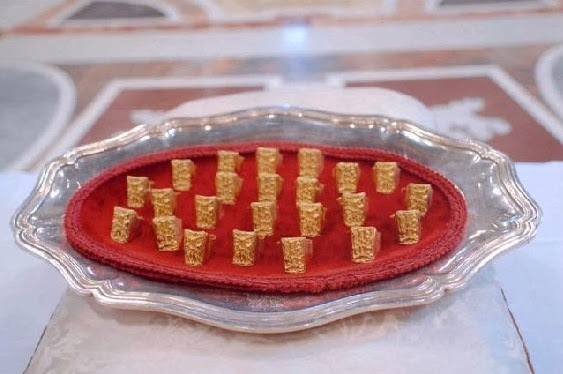 If prior practice holds, the biglietto (literally, the "ticket" listing the cardinals-designate in specific order of precedence) will be read out by the Pope either at an Angelus or Wednesday Audience within the next two weeks. In recent rounds, the choices have been privately tipped off a day in advance by their local Nuncio, or the Secretariat of State for those resident in Rome. Though Consistory announcements have traditionally been anticipated by a flood of pre-game indications – and, in an unprecedented move, the coming event was confirmed by the Holy See four months in advance – the news of B16's last batch in October 2012 came as a genuine shock on practically all sides. Since his own election, meanwhile, Francis' consolidation of his decision-making and communications operations at the Domus has resulted in the most leak-proof Vatican administration in recent memory. In addition to the core rites themselves – the Consistory to confer the red hat and ring on the new cardinals on the 22nd and a concelebrated liturgy the following day – the days preceding the celebrations will bring the third meeting of Francis' eight-man Council of Cardinals (which could well be expanded to include members of the new intake), as well as two days of consultation among the whole 200-member College, set to focus both on the reform of the Roman Curia and, as announced last week, October's Extraordinary Synod on the pastoral challenges facing the family. Beyond tomorrow's usual Noontime appearance at his office-window, Monday's Epiphany offers Papa Bergoglio an extra opportunity to relay his picks; maintaining the tradition of his predecessors, Francis will celebrate a morning Mass in St Peter's before an extra-edition Angelus for the major feast marking the 12th day of Christmas, which is transferred to Sunday in most of the Catholic world. To be sure, there's recent history to this – a Consistory on 18 February 2012 and its 22 cardinals- designate were announced by Benedict on the preceding Epiphany. As things stand, by the designated date this time the College will be 14 men short of the statutory maximum of 120 voting members younger than 80, set by Paul VI in 1973. Though another ten cardinals will age-out of a hypothetical Conclave over the course of 2014, the Pope is fully free to dispense from the now-customary limit, which John Paul II once pushed as high as 135. Given Francis' own reluctance toward convention for its own sake and willingness to set it aside, it'd come as little surprise if the Argentine pontiff opts to go beyond the 120 figure, in particular to begin in earnest a widely expected project to spread the scarlet to areas where large, especially vibrant Catholic populations have been historically underrepresented to a glaring degree in the papal "Senate." How all this will bear itself out remains to fully be seen, but whatever its shape, see it we will in short order... so yet again, folks, stay tuned – and buckle up.